A well-maintained carpet dramatically improves the appearance of the room. But even with frequent vacuuming, carpets tend to get dirty with age which affects indoor air quality. Professional carpet steam clean services offer good value for money and leave your carpets clean and new. 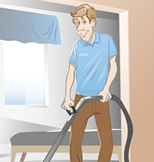 It is not enough to vacuum and clean carpets when they look dirty. By the time visible dirt occurs, your family members will have been exposed to millions of minute dust particles. help, but a household vacuum misses a lot of dirt and some stains require professional cleaning. Regular steam cleaning may increase the life of the carpet and keep it functional for longer. If you are leasing your house in Adelaide, your rental agreement will include professional carpet cleaning when you move out, or maybe once a year.